To reserve your space using our form click here or call 1-800-867-0453 or 360-577-6474 or fax us at 360-577-7107 to reserve your space today! 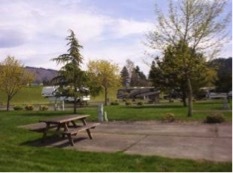 Our Standard Rates include the stay in a site of one RV, one or two vehicles, and two people. Water, sewer, electrical, and cable TV hookups are also included in this rate. Check-In/Check-Out time is Noon. Groups – Group rates available, please contact park directly. *All Rates and Fees are in US funds (Premium pull-through sites additional fees apply). Call 1-800-867-0453 or 360-577-6474 or fax us at 360-577-7107 to reserve your space today! Check-In/Check-Out Time is 12:00 Noon. A full set of park regulations will be issued upon check-in. Please contact us if you desire a copy of the rules prior to check-in. No large dogs greater than 25 lbs (12 kg) in weight are accepted on long term stays. Only one small house dog or cat is welcome. Dogs must be kept on a leash while outdoors at ALL times. For pet relief, we ask that our guests please walk dogs along the hill that surrounds the park and pick up pet droppings immediately. Any pet that causes complaints or is a nuisance will not be allowed to remain in the park. Hybrid wolf & coyote, pit bulls (aka American Staffordshire Terriers), Rottweilers, Dobermans and Mastiffs not allowed in park.